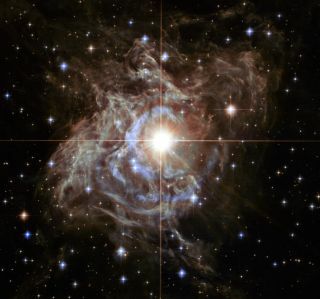 The Hubble Space Telescope snapped this image of the bright southern hemisphere star RS Puppis. Thousands of scientists will gather in Washington, D.C. this week for a five-day conference that has been billed as the "Super Bowl of astronomy." The 223rd meeting of the American Astronomical Society (AAS) begins Sunday (Jan. 5) and runs through Thursday (Jan. 9). Conference organizers are anticipating a big turnout. "We're expecting more than 3,000 attendees, but probably not enough over 3,000 to beat our record of about 3,400 last time we met in D.C. (4 years ago)," AAS press officer Rick Fienberg told SPACE.com via email. At the meeting, researchers from around the world will present the latest findings about our own solar system, alien planets, black holes and the evolution of the universe, among other topics. Some of the biggest discoveries will be announced during press conferences, which will be held Monday through Thursday. These briefings will be webcast live for reporters, and the general public will have access to them shortly after they occur, Fienberg said. "Once we archive them online (usually within a day or two), anyone can watch the recordings at any time," he said. AAS 223 will also feature a number of "town hall" presentations, in which officials from NASA, the National Science Foundation and other organizations will discuss their funding outlooks and provide status updates about current and future observatories and missions, such as NASA's $8.8 billion James Webb Space Telescope, which is slated to launch in 2018. "As is always the case when we meet in the U.S. political center of gravity, we’ll give special emphasis to public policy," AAS officials wrote in a description of the meeting several months ago. "In addition to the policy-related Town Hall sessions, we’ll hear a special plenary address from a high-ranking official involved in science funding and science policy." SPACE.com will provide complete coverage of the winter meeting, one of two that AAS holds each year. The previous conference, AAS 222, took place in Indianapolis last June; AAS 224 will be held this coming June in Boston. SPACE.com reporters Miriam Kramer @MiriKramer and Tanya Lewis @TanyaLewis314 will be reporting from the event. The meeting's Twitter hashtag is #aas223.